He Continues to Make a Difference is a resource for high school educators that includes information and best practices for supporting LGBT students and developing an LGBT-inclusive curriculum, along with classroom resources and lessons aligned with ELA Common Core State Standards. Click HERE to learn more. OCTOBER MOURNING: A SONG FOR MATTHEW SHEPARD is a cycle of sixty-eight poems that serves as an illumination for readers too young to remember and as a powerful, enduring tribute to Matthew Shepard’s life and legacy. Click HERE for more information about the book and accompanying resources. This resources was developed by GLSEN, the Matthew Shepard Foundation, Lesléa Newman and Candlewick Press. Click HERE to learn more about the partners and their offerings. Introduce Matthew's Place to your LGBTQ Students! MatthewsPlace.com is an online community and resource site for lesbian, gay, bisexual, trans*, queer and questioning youth ages 13 to 24. The LGBTQ safe space works to support youth, combat bullying, and give young people a platform to make their voices heard. 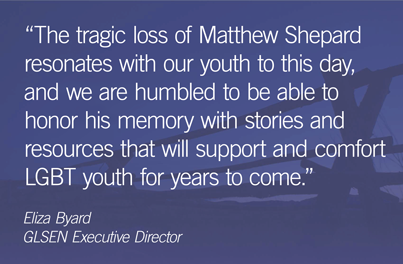 Matthew’s Place is a program of the Matthew Shepard Foundation. The foundation was founded after the death of Matthew Shepard following a traumatic attack he suffered in one of America’s most notorious anti-gay hate crimes in Laramie, Wyoming. Since its creation, MatthewsPlace.com has received hundreds of thousands of unique visitors who have used its 50-state resource and service directory; read inspirational interviews with LGBT and allied professionals, political leaders, entertainers and activists; participated in chat sessions with Matthew Shepard Foundation staff and special guests; and viewed written and video blogs by LGBT youth across the country. The site is inspired by the intense need for information, support and services by LGBTQ youth, particularly in rural areas where in-person services and organizations are sparse or nonexistent. The site hopes to inspire happiness, health, and positive choices among LGBTQ youth.